first off, hello everyone!! i'm very new to KH [i played it super briefly as a child but i never even managed to get off of the island, lol] and i just completed the first game yesterday. i really really enjoyed it and i'm hoping to start chain of memories today or tomorrow, but i just wanted to clear up some stuff over the ending first to make sure i'm understanding it correctly. i know a lot of people say the story gets really convoluted and stuff, so i don't want to confuse myself. so, one thing i'm really confused about is the door at the end. i know it's the door to kingdom hearts, but the first time we see it open it emits the light that kills ansem, and yet when sora and mickey close it at the end, it's crawling with heartless. is it supposed to be the door to light or the door to dark? or is it something else entirely? i'm afraid i don't really get it. is it that it's both at the same time? light on one side, dark on the other, or something...i'm sure it's probably not that confusing, so sorry if i'm missing something really obvious! on the same topic of doors, i'm a little confused about what happened with riku in hollow bastion. this scene, specifically. i know now that it must be mickey talking [i thought it was ansem or someone while i was playing, lol. i totally missed the point] but i'm still sort of confused. why is he in the realm of darkness? is that where everyone's heart is, or...? in one of ansem's reports it says that a nobody is a body that's been abandoned by the heart, so does that mean that the hearts that abandon the body wind up where riku was? if that makes sense. if that's something that gets covered in a different game then that's totally fine; i realise i may be looking for too many answers at once, lol. the last thing i'm confused about is where sora wound up at the end. should he not have returned to the island? i thought that was his world, so i don't really understand why he didn't go back there and kairi did, even though she's not originally from the island. where did he wind up? sorry for such a long winded question! i really hope it makes sense. Hi there! Welcome to the series and to the forums! The Kingdom Hearts series mostly takes place in a place called the Realm of Light, but in the world there are a few different realms. For now, let's focus on the Realm of Light, The Realm of Darkness and the borderland, the Realm in-between. The Realm of Darkness is the place from which the Heartless spawn, and it's also where worlds go once they're lost to the Darkness. That Realm is also where Ansem's Kingdom Hearts was created. In order to access it, Ansem summoned a door the realm of darkness. Once that door was sealed, the Kingdom Hearts that Ansem summoned was destroyed and all the worlds that were lost were restored. The door was to the realm of Darkness, but hidden in its depths was Kingdom Hearts, and that's where the light came from. You're right about Riku! Once Ansem expelled his heart from his body, it went straight to the Realm of Darkness, and after Ansem was destroyed he regained his body and rushed to the door in an effort to help Sora close it. Sora ended up in a world in the in-between realm that we talked about earlier, after the End of the World was destroyed. Sora, Donald, and Goofy made a pact to continue their journey in an effort to find Riku and Mickey. That resolve to keep going kept them from returning to their worlds. Where exactly they ended up, you find out in Chain of Memories. The Kingdom Hearts in KH1 was an artificial Kingdom Hearts made out of the hearts of worlds. Ansem, Seeker of Darkness made an artificial Kingdom Hearts made out of the hearts of worlds that fell to darkness. The Door to Darkness doesn't lead to this Kingdom Hearts. Through the Door to Darkness is the Realm of Darkness. The Door to Darkness was an entrance to the Realm of Darkness. It coexisted with Ansem, Seeker of Darkness' artificial Kingdom Hearts. Think of it as like an extension of Ansem, Seeker of Darkness' artificial Kingdom Hearts, like a limb of it. They're connected in a special way, even though they're not physically connected. The light that came out of it was the light from the artificial Kingdom Hearts. But, the artificial Kingdom Hearts wasn't located through the door in the Realm of Darkness, it was located behind the door. To clarify what I mean, there's a difference between "behind the door" and "through the door." Through the door is the Realm of Darkness. Behind and around the door is End of the World (a world that was located in the Realm of Light). And behind the door, you could see a giant silhouette of the artificial Kingdom Hearts. A big heart shaped moon. 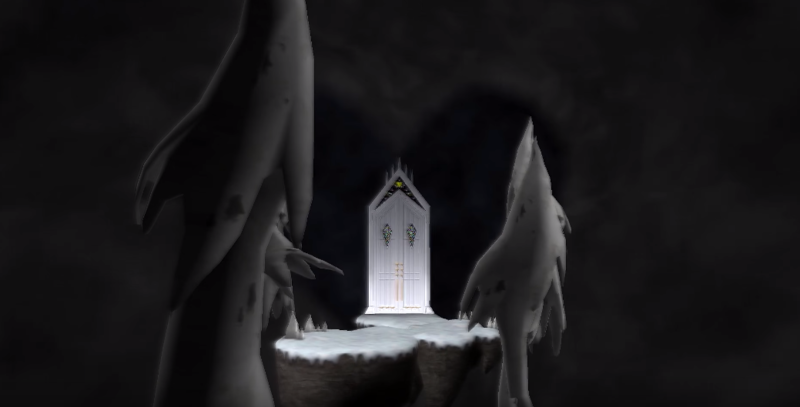 Ansem, Seeker of Darkness' artificial Kingdom Hearts was located behind the Door to Darkness in End of the World. This is sort of confusing through text, so here's an image of the silhouette. You can see that it's behind the door. It might seem to not make sense for the artificial Kingdom Hearts to be able to shine light through a door that it isn't physically touching, but Kingdom Hearts works in weird ways. To put this all in simple terms: the artificial Kingdom Hearts was able to shine light through the Door to Darkness even though it's not within the Door to Darkness and even though it's not physically connected to the Door to Darkness simply because it has a weird special connection to the Door to Darkness. Oh, and to explain what I mean by "artificial" Kingdom Hearts would be spoilers for future games. As for the Riku thing, Ansem, Seeker of Darkness/the brown Robed Figure possessed Riku's body and sort of kicked his heart out and into the Realm of Darkness. Ansem, Seeker of Darkness then sort of molded/formed Riku's body into one that's more to his likeness, and became the Ansem, Seeker of Darkness we all know and love. When Sora destroyed Ansem, Seeker of Darkness, Riku's body was returned to him in the Realm of Darkness and he became whole again. He couldn't leave the Realm of Darkness because only beings of darkness/Heartless can pass through the Door to Darkness. And as for the Sora thing, End of the World was a world that was created out of chunks of worlds that fell to darkness. When a world falls to darkness, it gets sent to the Realm of Darkness. But, some chunks of the worlds can sometimes stay in the Realm of Light. And they all formed together to create End of the World. When Sora sealed the Door to Darkness, it broke apart the artificial Kingdom Hearts, and all of the hearts of the worlds returned and the worlds were returning. Kairi returned to Destiny Islands because she was on a chunk of Destiny Islands that was returning. So she returned with it. Sora, Donald, and Goofy were on a chunk of a different world, and they returned to that world along with the chunk they were on. You will learn more about that world in Kingdom Hearts Re:Chain of Memories.